The role of active galactic nuclei (AGN) in the formation and evolution of galaxies is still not well established. Some authors claim that AGN are key in quenching star formation in their host galaxies through so-called AGN feedback, which has been invoked to explain the well-established correlations between supermassive-black-hole (SMBH) mass and host-galaxy properties. In order to understand the importance of AGN feedback in the star-formation histories of galaxies, it is necessary to study how the star formation rate (SFR) in active galaxies evolves with redshift. The near-infrared (NIR) range offers an opportunity to study the optical spectra of galaxies at redshift z~1. At this redshift, the H-alpha line is shifted into the J band. However, characterizing the SFRs of active galaxies using H-alpha is very challenging, as the AGN contributes to both the continuum and the emission-line spectrum. A team of Spanish astronomers reported the largest compilation to date of NIR spectra of AGN at redshift z~0.8. The data were obtained using the multi-object spectroscopic mode of the Long-slit Intermediate Resolution Infrared Spectrograph (LIRIS) at the William Herschel Telescope (WHT). These active galaxies are representative of a larger sample studied in a previous work, consisting of over a hundred X-ray selected sources with mid-infrared counterparts, which were classified either as AGN-dominated or host-galaxy-dominated, depending on the shape of their spectral energy distributions (SEDs). Four masks were designed and the chosen slit width was 0.85 arcsec, with the slit lengths varying between 8.5 and 12 arcsec, allowing enough space for nodding while avoiding overlap of the spectra. The low-resolution grism ZJ was used, covering the range 0.8-1.4 microns, and providing a velocity resolution of ~500 km/s. The spectral range varies depending on the position of the slits on the mask in the spectral direction. Thus, a slit in the centre of the mask will provide a spectrum in the nominal spectral range, whereas spectra obtained with slits closer to the edges of the mask will be shifted either bluewards or redwards. This study is based on NIR spectra of 13 and 15 sources of each class, respectively. Using attenuation-corrected H-alpha luminosities and observed Spitzer/MIPS 24 micron fluxes, and after subtracting an AGN component estimated using an AGN empirical correlation and multifrequency SED fits, the authors obtained average SFRs of 7 ± 7 and 20 ± 50 solar masses per year, respectively. 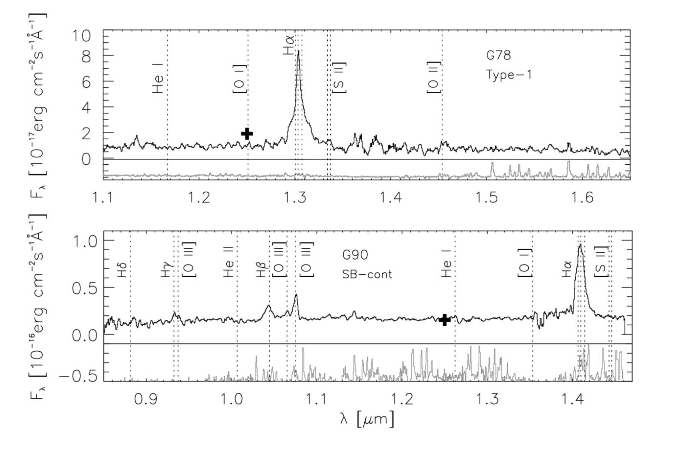 Observed NIR LIRIS spectra of the galaxies G78 (AGN dominated) and G90 (host-galaxy dominated). Typical AGN emission lines are labelled. The H-alpha labels correspond to H-alpha+2[N II]. Scaled sky spectrum for each galaxy is plotted at the bottom. Observed J-band fluxes from imaging are represented with a cross for comparison. [ GIF ]. Comparing their results with those published in the literature for non-active star-forming galaxies of similar stellar masses and redshifts, the authors found that the AGN SFRs are lower on average, although with a large dispersion. In spite of the small size of the samples involved in this comparison, the results indicate that the presence of an AGN in a galaxy at z~0.8 might be quenching its star formation. Alternatively, they propose that there could be a delay between the offset of the star formation and AGN activity, as observed in the local Universe. The science team consisted of Dr. Cristina Ramos Almeida (IAC), Dr. José Miguel Rodríguez Espinosa (IAC), Dr. José Antonio Acosta Pulido (IAC), Dr. Almudena Alonso-Herrero (IFCA), Dr. Ana María Pérez García (IAC) and Ms. Nayra Rodríguez Eugenio (IAC). Ramos Almeida, C., Rodríguez Espinosa, J. M., Acosta Pulido, J. A., Alonso-Herrero, A., Pérez García, A., Rodríguez Eugenio, N., 2013, "Probing nuclear activity versus star formation at z~0.8 using near-infrared multi-object spectroscopy", MNRAS, doi: 10.1093/mnras/sts611.